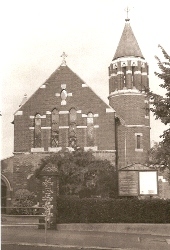 The red brick church serves a parish formed from Preston for the new housing in Ditchling Road. An iron church preceded the present one, which was designed by L W Ridge (ESRO Par 458/9/1/1) and is more ambitious than most he built. It was built in two phases, the chancel in 1907 (CDG 164 p119) and the rest in 1911 (ibid 213 p164). The total cost was £7538 1s 10d and Ridge himself gave £10 10s. Ridge designed an aisled church with an apse in late C13 style with lancets, some trefoiled. The church is on a slope, allowing a parish room beneath the chancel. A round south west tower, more substantial than a turret and with a conical spire, rises from a square porch. The carpentry is fine, with a nave roof combining hammerbeams and collars. That of the chancel has a single tiebeam with a much braced queenpost. The moulded heads of the arcades and chancel arch are brick and only the chancel lancets have shafted rere-arches. There were repairs to the east end in 1966-67 by N Burgis (ICBS). Font: Carved and octagonal. It came from St John, Meads, Eastbourne (CDG 209 p91) and may date from the late 1860s when that was built originally (it was much extended at various dates and then effectively rebuilt after damage in World War II)). 1. Heaton, Butler and Bayne The present whereabouts of this glass, the existence of which is given in a company catalogue, cannot be ascertained (Bayne p126). 2. (Apse, north and south and north aisle, fourth window) W Glasby, 1925, 1929 and 1932 (D Green and D and J Hadley, p102). 3. (Main west window) H W Lonsdale, 1917-21 (www.stainedglassrecords.org retrieved on 4/2/2013). 4. (West window, high) C Webb, 1938 (ibid). 5. (North aisle, first to third windows and south aisle, third window) J Powell and Sons, 1948 (Order book). 6. (North apse east window and all south aisle windows except third) Barton, Kinder and Alderson, 1948-70 (www.stainedglassrecords.org retrieved on 4/2/2013). The designer was C Knight (BE(E) p280). Reredos: Panelled and probably contemporary with the chancel.